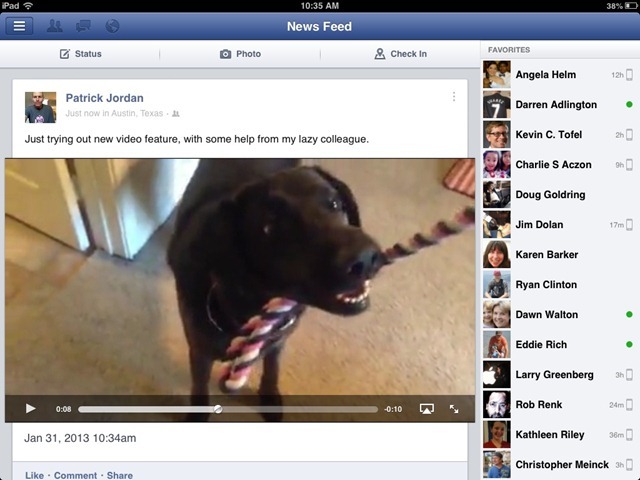 The Facebook app for iPad and iPhone has been updated this week, to Version 5.4. Headlining the short list of new features in the update are the ability to send voice messages and record and share video right from within the app. You send a voice message via the chat section of the app – use the + button at the bottom left of the chat window to bring up the option to record voice. You can record and share video while doing a status update. This will let you choose an existing video from the Camera Roll or record a new one. Both features work just as advertised. I honestly enjoy using Facebook far more on the iPad now than on the desktop. Here’s an App Store link for Facebook; it’s a free app and a universal app designed for both the iPad and the iPhone.